On the eve of Press Freedom Day, a group of African writers joined together at the PEN World Voices Festival of International Literature to call for the release of six bloggers and three journalists in Ethiopia who were arrested on Friday, April 25. The bloggers, who call themselves Zone 9, were rounded up in the latest assault on press freedom and free expression in the country. Today PEN American Center joined the Media Legal Defence Initiative and a coalition of groups to submit an urgent request to the Special Rapporteurs at the African Union and the United Nations (PDF), calling for an immediate intervention into the arrests. Exactly one week ago today, six bloggers and three journalists were arrested in Ethiopia. They call themselves Zone 9. The name was derived from the section of Kality Prison where journalists are held, which is called Zone 8. 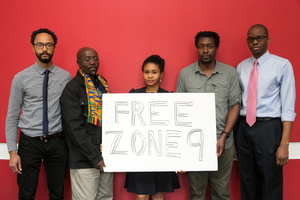 According to the bloggers, Zone 9 represents the invisible prison that surrounds all the citizens of Ethiopia, who may be arrested at any time for exercising their right to free expression. Ethiopia operates one of the most sophisticated internet monitoring and filtering systems in the world, and these arrests are the latest example of impunity in the country. Journalists Eskinder Nega and Reeyot Alemu continue to suffer in prison for their free expression on lengthy sentences. The motto of the Zone 9 bloggers is simple: “We Blog Because We Care”. They blogged in the face of government harassment, threats, surveillance and intimidation, and they filled the silence created by the government’s ongoing crackdowns on free speech and dissent. Today, we say that we write because we care. Journalism, writing, and blogging are not crimes. We call upon the government of Ethiopia to release all 17 journalists and bloggers imprisoned in the country. And we also urge President Obama and the U.S. Government to support human rights and free expression in Ethiopia.